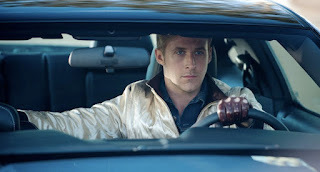 Ryan Gosling is a never-identified-by-name Hollywood stunt driver who moonlights as a getaway wheelman for hire in this bleak and brutal modern-day film noir. At scenes of the crime, his clients have exactly five minutes to do whatever dirty work they have in mind and get back to the car. Then it’s up to their tight-lipped chauffeur to evade detection and escape pursuit. Rose’s even more menacing fellow mobster Nino (Ron Perlman) is a snaky psycho whose goons once broke Shannon’s pelvis for payback, hence the mechanic’s limp. It’s a rough crowd. Always attired in an old-school quilted jacket with an embroidered scorpion on the back, the driver seemingly has skated above the nastier physical realities of thug life. He begins an awkward friendship with a pretty neighbor named Irene (Carey Mulligan). Her young son’s father Standard (Oscar Isaac) is in prison, but he’s due home soon. One of the most refreshing things about "Drive"‘s stark screenplay, adapted by Hossein Amini from the novel by James Sallis, is the way its plot detours into some dark alleys. A cheesy, twice-heard soundtrack song that’s like a retro-'80s "Top Gun" reject about “a real human being and a real hero” is more ironic than uplifting. And like "Taxi Driver"‘s Travis Bickle, this equally taciturn driver never seems completely noble, even when he’s doing the right thing. Besides the ominous impending arrival of Standard, other plot elements that take unanticipated turns involve Shannon’s dream of getting financial backing for a stock car and Rose’s uneasy underworld relationship with Nino. The movie’s outbursts of violence occur with shocking suddenness and are graphically gory. When the driver’s signature jacket gets bloodstained, it damned well stays bloodstained. Gosling works the unblinking stare and disturbingly extended pause routine to maximum antihero effect. After a stock car trial run, he ignores gangster Rose’s proffered hand for an uncomfortable amount of time before deadpanning, “My hands are a little dirty.” Rose replies through a frozen smile, “So am I.” Classic. Gosling is excellent at portraying the kind of calm, cool and collected crocodile who can turn deadly in an instant. But he also has the steel to tell a former employer to shut his mouth "or I’ll kick your teeth down your throat and shut it for you" without raising his voice. Scenes like those make up for the screenplay’s bad habit of having characters explain how they met, which happens no less than three times (Shannon and the driver, Rose and Shannon, and Standard and Irene). That’s a minor complaint, however, about such an otherwise relentlessly entertaining movie. Director Nicolas Winding Refn previously helmed a number of Danish films, as well as 2003′s disturbingly surreal "Fear X" (cowritten with Hubert Selby Jr). Drive isn’t as far off the beaten path as that nightmarishly abstract mystery, and benefits from a less frustrating ending (although viewers may disagree about what really happens before the movie's final credits roll). Speeding on the sun-baked concrete bed of the LA river, racing through the videogame-like nighttime grid of the dark city or evading murderous pursuit after a robbery gone wrong, Gosling’s nameless driver is impressively adept at providing a wild, heartracing and thrillingly unsafe ride. So is "Drive" itself.